HubSpot 3 Workflows - Integrate, Automate and Love! For the past 2 weeks, I have been on pins and needles waiting for the official announcement of HubSpot 3. I can't even begin to tell you how excited I was after previewing an early demo. Finally, now that the world knows about HubSpot 3, I can come out of hiding to talk about all of the latest features! Earlier, you were introduced to the Contacts Database and Email Tools. I'm excited to introduce Workflows next and show you how to leverage information from the database to automate some pretty amazing sales and marketing actions. If you are familiar with HubSpot's Lead Nurturing Tool, that is what Workflows will be replacing in the new rollout. The best part about Workflows is that it is in no way limited to just email automation. In addition to triggering emails, workflows can trigger campaigns, change contact profile properties, score leads, send internal notifications, and sync to a CRM system based on when a lead has met a set of conditions. As before, workflow starting conditions can be tied to form submissions. However, you can also limit the condition to form submissions from specific pages. Multiple forms can be included by adding a 2nd starting condition (this is like adding an OR statement). For example: Limit the starting condition to a case study download form on the company's contact page OR a case study download form on the company's service overview page. You can trigger workflows based on activities such as, page views, social media mentions, information filled out in a form, and much more. create inbound workflows and smart lists based on data in CRM, such as total lifetime value, industry, etc. sync social data to crm, like twitter followers and social media clicks! In the old lead nurture tool, campaign timing was based on business days. Workflows allow you to select weekend delivery as an option within the settings of each individual workflow. 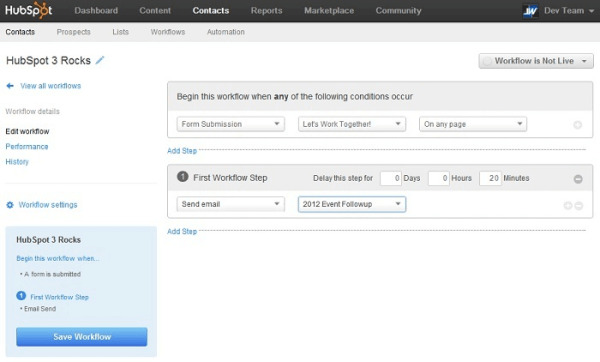 Workflows work with HubSpot’s new email tool. The new easy to use interface allows you to create professional looking and personalized emails. Performance reporting lets you see which contacts opened which messages and when, which links they clicked on, and what actions they ultimately took. Hooray for open rate metrics!! We haven’t even really begun to scratch the surface on the capabilities and benefits of the new Workflows feature. I said I love HubSpot earlier this month, but now I’m starting to think that was just puppy love. HubSpot 3 is quickly blossoming into my one true love. Does anyone else feel this way? Don’t go too far. Tomorrow, we'll cover the details of even more HubSpot 3 features. See you then! Next in the HubSpot 3 series CTA Manager, Landing Pages, Smart CTAs, and Social Contacts.